Gettysburg Licensed Battlefield Guide John Fitzpatrick is the host for this series on the Irish Brigade. 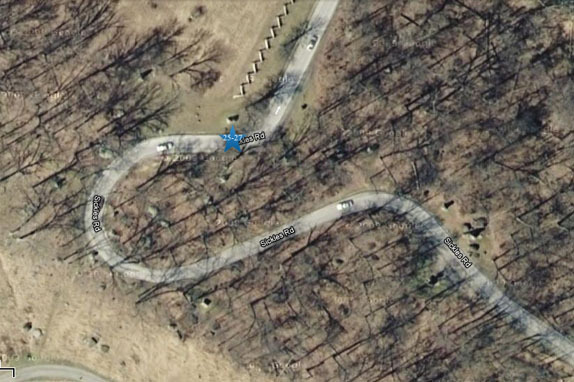 He is standing at the top of the Stony Hill near the monument to the 116th Pennsylvania Infantry Regiment. Sickles Avenue is on the right. This view was taken facing northeast at approximately 4:45 PM on Friday, February 3, 2012. Gettysburg Licensed Battlefield Guide John J. Fitzpatrick, Jr., Esq. is host for a series on the Irish Brigade at Gettysburg. John’s interest in Gettysburg began in centennial year of 1963 when he arranged a trip to the Battlefield for the Villanova University Student History Club. That sparked a continuing interest in the American Civil War. Throughout his travels in the Service, work and some vacations he has been to Civil War sites coast to coast from Fort Point under the Golden Gate Bridge, San Francisco, California to the home, church and College of Joshua Lawrence Chamberlain in Brunswick, Maine. He is now entering upon his ninth year of Guiding at Gettysburg. His professional career began in 1966 as a United States Marine Corps Officer, Tank Platoon Commander then Pilot. He served a combat tour of duty in Vietnam completing 140 missions in the A6 Intruder for which he was awarded 9 Air Medals and Vietnam Service Awards. Captain Fitzpatrick was Honorably Discharged from Active Duty in 1971 whereupon he entered law school. Upon graduation in 1974 he began a 32 year career as Corporate Counsel for Gulf Oil and Chevron Corporation retiring in 2006. He is a Member in good standing before the highest Courts in Pennsylvania, the District of Columbia and California. Contemporaneously with his first legal job, he transferred to the Pennsylvania Air National Guard and later the U.S. Air Force Reserve. He served as an Active Reservist Pilot/Forward Air Controller/Squadron and Group Training Officer at the Willow Grove NAS, PA from 1974-1984. He was transferred to HQ USAF at the Pentagon in Legislative Liaison from 1985-1993 and finally as a JAG Officer reporting to the USAF TJAG and General Counsel from 1993-1997 based on his civilian expertise to assist the Air Force with its new Arbitration and Mediation Programs. Colonel Fitzpatrick received 3 Meritorious Service Medals, the Air Force Commendation Medal and other Awards before transferring to the Retired Reserve in 1997. He now divides his time amongst Guiding at Gettysburg, certain volunteer Veterans’ activities and serving as an Arbitrator in commercial, construction and securities cases. In addition to tours at the Gettysburg National Military Park, John also presents President Lincoln and the immortal Gettysburg Address, specifically in the context not only of the battle, but the enormous personal, political and policy pressures affecting the President when he prepared and how he presented it. He has spoken to Civil War Roundtables, Historical Societies, Rotaries and other church/civic/private clubs in PA, MD, CA and is scheduled to present in IL during 2013. To contact John, please click here to reveal his email address. In today’s Irish Brigade Post, Gettysburg Licensed Battlefield Guide Emeritus John Fitzpatrick shows the Irish Brigade’s line of battle on the Stony Hill, and discusses the legacy of the Irish Brigade. To see the previous Irish Brigade posts, click here. 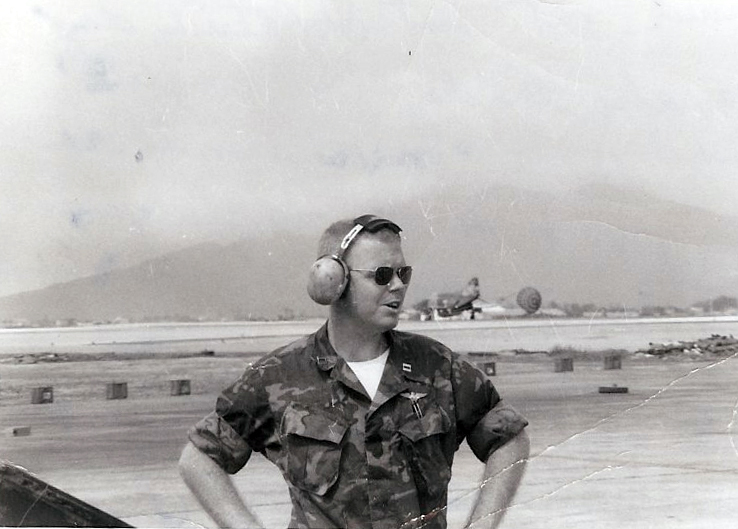 Captain Fitzpatrick on the US Marine flight line, DaNang, Vietnam, March 1970, a US Air Force F-4 Phantom Fighter having just landed in the background. This map shows the location of the Irish Brigade videos. Video #1-#24 were shown in our previous posts. Videos #25-#27 were taken near the top of the Stony Hill along Sickles Avenue. This map was created facing north at approximately 6:30 PM on Wednesday, February 22, 2012. 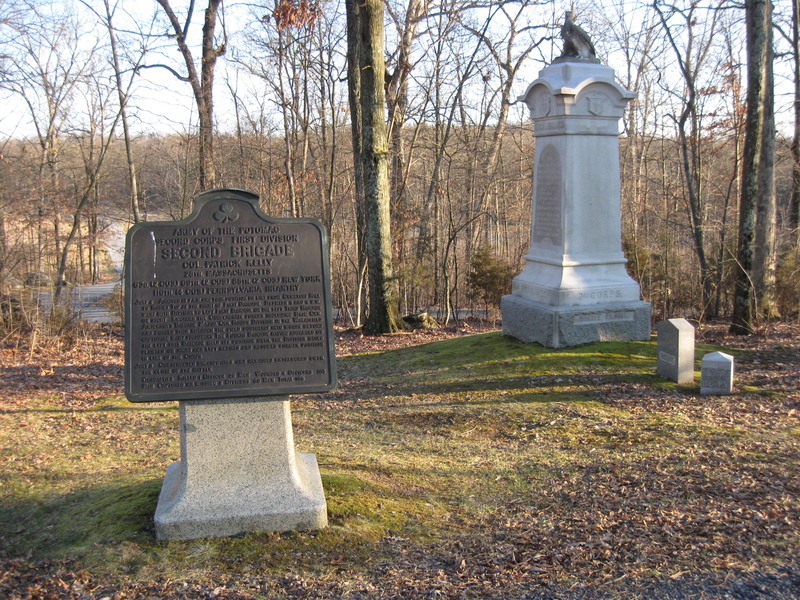 On the east side of Sickles Avenue at the top of the Stony Hill is the marker for the Irish Brigade on the left, and the monument to the 28th Massachusetts Infantry Regiment on the right. This view was taken facing east at approximately 4:45 PM on Friday, February 3, 2012. In Video #25 (Videos #1-#24 were shown in our previous posts) Gettysburg Licensed Battlefield Guide John Fitzpatrick shows the Irish Brigade’s line of battle on the Stony Hill. This view was taken facing northwest to southeast to southwest at approximately 4:45 PM on Friday, February 3, 2012. 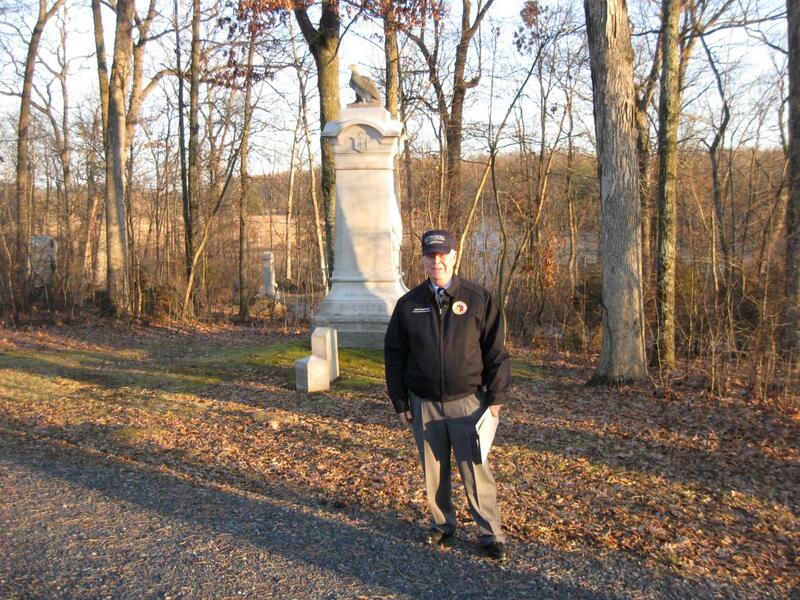 Gettysburg Licensed Battlefield Guide John Fitzpatrick is standing at the top of the Stony Hill near the monument to the 116th Pennsylvania Infantry Regiment, which was dedicated on September 11, 1889 (Pennsylvania Day). Part of the Sherfy Peach Orchard (The Peach Orchard) is barely visible in the left background. This view was taken facing northwest at approximately 4:45 PM on Friday, February 3, 2012. 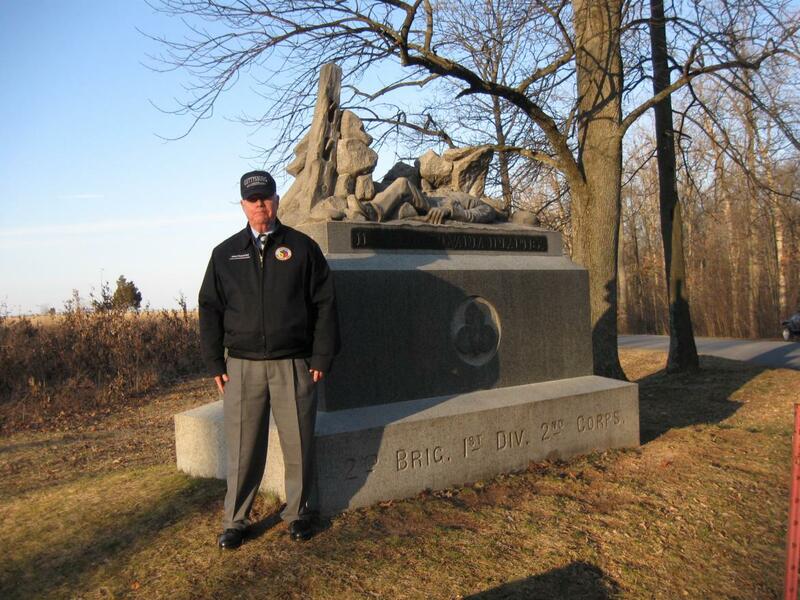 In Video #26 Licensed Battlefield Guide John Fitzpatrick is standing near the 116th Pennsylvania monument. He thanks some individuals and groups for their help on the Irish Brigade series, and summarizes some previous posts on the Irish Brigade.This view was taken facing northwest at approximately 4:45 PM on Friday, February 3, 2012. 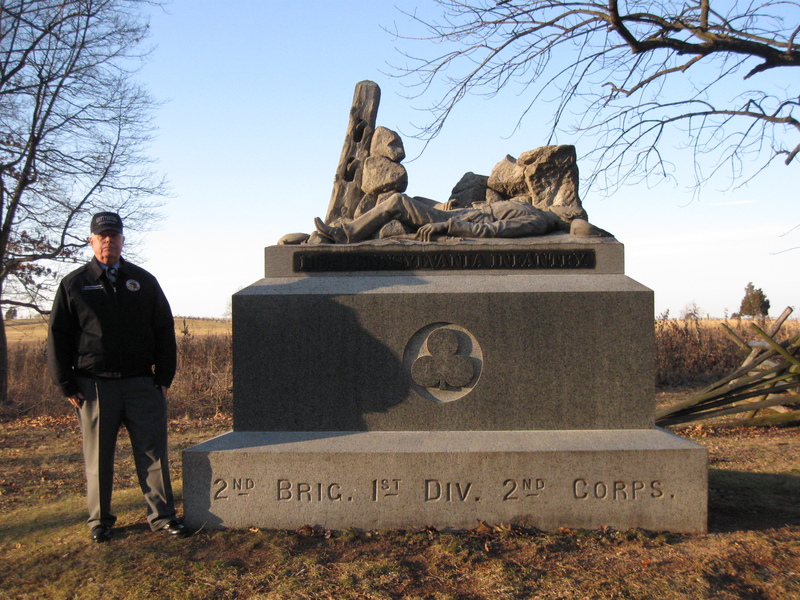 Licensed Battlefield Guide John Fitzpatrick is standing near Sickles Avenue and in front of the monument to the 28th Massachusetts Infantry Regiment, which was dedicated on October 8, 1885. This view was taken facing east at approximately 4:45 PM on Friday, February 3, 2012. In Video #27 John Fitzpatrick is standing on the Stony Hill with the monument to the 28th Massachusetts Infantry Regiment in the background. He explains the legacy of the Irish Brigade. This view was taken facing east at approximately 4:45 PM on Friday, February 3, 2012. 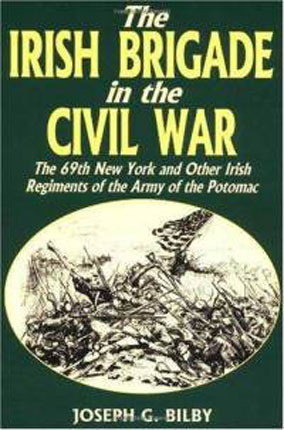 Here is one of the texts that John Fitzpatrick used for his Irish Brigade posts, and that he recommends: The Irish Brigade in the Civil War, The 69th New York and Other Irish Regiments of the Army of the Potomac by Joseph G. Bilby. This image was copied facing north at approximately 8:00 PM on Friday, November 18, 2011. 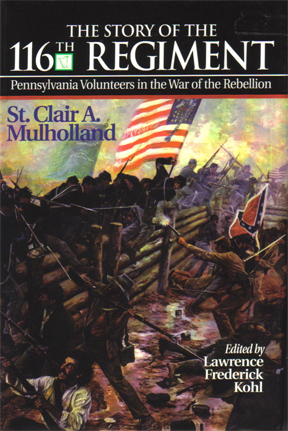 Here is one of the texts that John Fitzpatrick used for his Irish Brigade posts, and that he recommends: The Story of the 116th Regiment Pennsylvania Volunteers in the War of the Rebellion by St. Clair Augustin Mulholland. This image was copied facing north at approximately 8:00 PM on Friday, November 18, 2011. 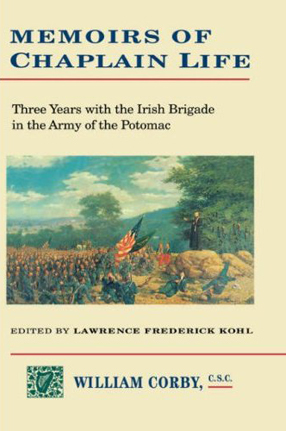 Here is one of the texts that John Fitzpatrick used for his Irish Brigade posts, and that he recommends: Memoirs of a Chaplain’s Life, Three Years in the Irish Brigade with the Army of the Potomac by Father William Corby. This image was copied facing north at approximately 8:00 PM on Friday, November 18, 2011. 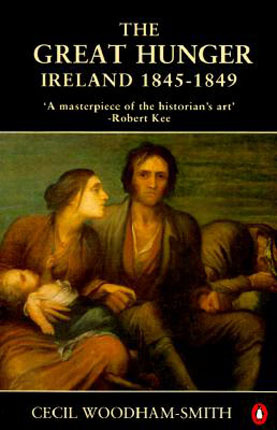 Here is one of the texts that John Fitzpatrick used for his Irish Brigade posts, and that he recommends: The Great Hunger, Ireland 1845-1849 by Cecil Woodham-Smith. This image was copied facing north at approximately 8:00 PM on Friday, November 18, 2011. 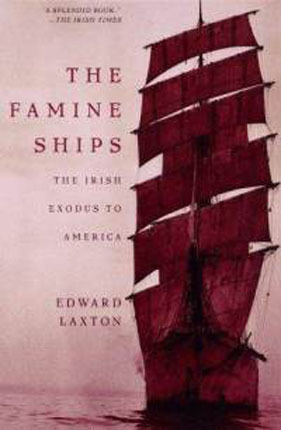 Here is one of the texts that John Fitzpatrick used for his Irish Brigade posts, and that he recommends: The Famine Ships, The Irish Exodus to America by Edward Laxton. This image was copied facing north at approximately 8:00 PM on Friday, November 18, 2011. 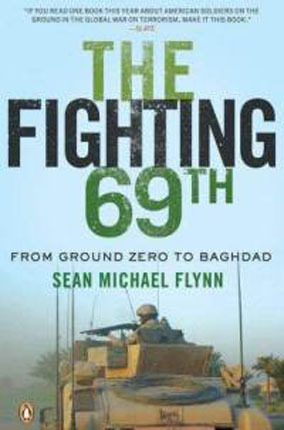 Here is one of the texts that John Fitzpatrick used for his Irish Brigade posts, and that he recommends: The Fighting 69th, From Ground Zero to Baghdad by Sean Michael Flynn. This image was copied facing north at approximately 8:00 PM on Friday, November 18, 2011.